The Blobs Noise node generates an image from a random set of metaball spheres of random radiuses that generate smooth blobs. Drag the Blobs Noise icon into the Node Graph. 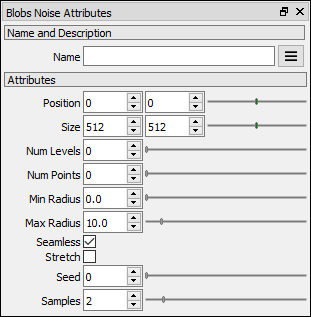 Adjust the attribute of the blobs noise node to modify the output image. Sets the position of the Perlin Noise image in the Image viewport in the X coordinate. Sets the position of the Perlin Noise image in the Image viewport in the Y coordinate. Sets the size of the Perlin Noise image. Number of levels of shading. A value of gives a continuous smooth shading. Minimum radius of the metaball spheres. Seamless If checked, the node generates a seamless tileable image. Stretch If checked, the spheres distribution in X and Y is proportional to the size. Seed use to generate the Perlin Noise. Samples Defines the number of samples per pixel. The real number of samples is the square of this value (samples x samples).